All of humanity is imbued with vitality sharing the essence of love through joy, passion, and a sense of adventure as they thrive in harmony for generations to come. My mission is to inspire and empower your greatness by facilitating extraordinary transformational healing, coaching, and workshops. I also provide books, classes and lectures. All for an extraordinary YOU! Once you experience yourself as extraordinary, your life will correspond accordingly. • Encouragement – I encourage people to see the best in themselves and others. • Honor and Respect – I respect people as unique individuals and honor what they are committed to. • Inspiration – I inspire others’ greatness by communicating to them their good attributes and sharing ways of improving the quality of their lives. • Love – I come from love and love people to my fullest capacity. 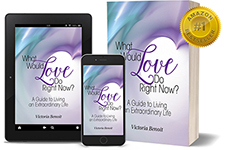 • Self-Empowerment – I see people as capable of immense growth and transformation with the power and willingness to make the necessary changes to live extraordinary lives according their highest purpose. • Support – I support people to do and be the best they can be, knowing their best is enough!